You either love them, or you hate them. Doesn't seem to be any in-between when it comes to beets! For all of you who love them, you've picked a powerhouse. Beets are packed full of fiber, potassium, folic acid, and manganese. They've been a dietary staple since before the Roman Empire and grace the tables of many modern homes. If you're looking to add beets to your home garden, here are some great tips about what beets need to grow! Beets want to bask in the glow of the garden sun, more so than many other plants you have growing. These plants prefer at least 10 hours of direct, unfiltered sunlight daylight and would be happy if they get some shade in the afternoon heat. If you have a garden spot that accommodates this, then perfect. Unlike most plants that grow their veggies above ground, beets form beneath the soil surface. For them to grow and develop without stunting or deformed shapes they need soil that is loose, friable, and free of rocks. Work in plenty of organic matter prior to planting to create an optimum soil bed. Many garden plants prefer slightly acidic soil to spread their roots in. Beets are no exception. They rely heavily on phosphorus in the soil for vegetable formation. Phosphorus availability is dependent on soil pH and is more available at a slightly acidic level. Beets prefer soils that have a pH between 6.0 and 6.8 for optimal growth. If you are unsure about your soil pH levels you can contact your local county extension office to ask about soil testing or purchase a home kit to test yourself. And if you need a refresher on soil pH, Garden.com has a great, short explanation. Failing to thin seedlings after they emerge is probably one of the biggest mistakes gardeners make when growing beets. What people don't know is that most seed packets actually contain little "capsules" with 2-6 viable seeds in each. So even if you're good about plant spacing when planting you might have numerous seedlings emerge in one spot. Allow seedlings to get about 5" tall and then thin by cutting the tops off, spacing plants 5-6" apart. Micronutrients are important --albeit in small amounts-- for plant growth. 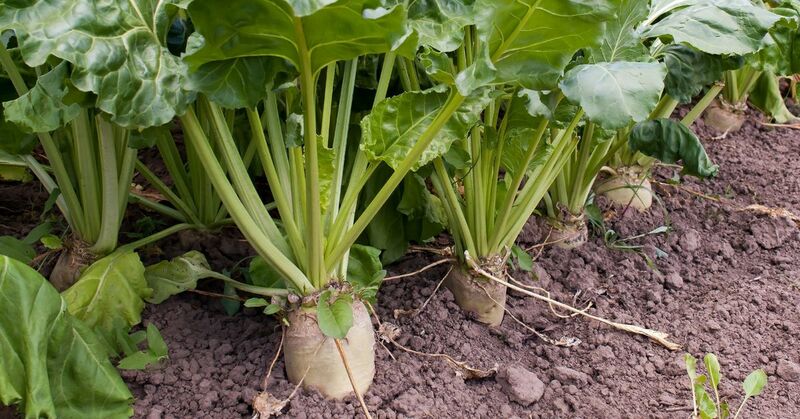 In beets, adequate soil boron is necessary; without the appropriate levels plant growth will suffer and the roots can develop internal black spots. This dependency is probably due to the plant's ancestral history but can be easily remedied by dissolving one tablespoon of Borax into 6 quarts of water and sprinkling it over the row at the time of planting. Check out Cornell University Cooperative Extension page for a more in-depth explanation of the role of boron in beets, and what deficiency symptoms look like. Keep the soil bed consistently moist after planting to make it easier for germinating seedlings to break through the surface. A dry soil will form a crust that is hard for them to push through and is hard to remedy once it forms. Once your beets get growing it's important to continue watering them regularly to avoid the roots becoming woody or cracking.